Butterfly Baby Place: Another awesome Natural Mommie Giveaway! Dude, I can't even believe my eyes. She's giving away an ORGANIC ERGO!!!!!!! I've died and gone to heaven... well, if I win, that is. THE GIVEAWAY: ERGObaby wants you to experience what truly handsfree babywearing is about and is offering Natural Mommie readers a complete ORGANIC hands free set valued at $212!! 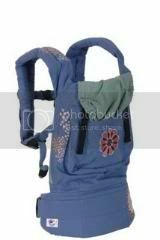 Set includes their 100% Organic Cotton Blue Carrier with a funky, mod embroidered floral design, the Organic Blue Backpack and the Organic Blue Front pouch. Click on any of the pics to get to her site!! !